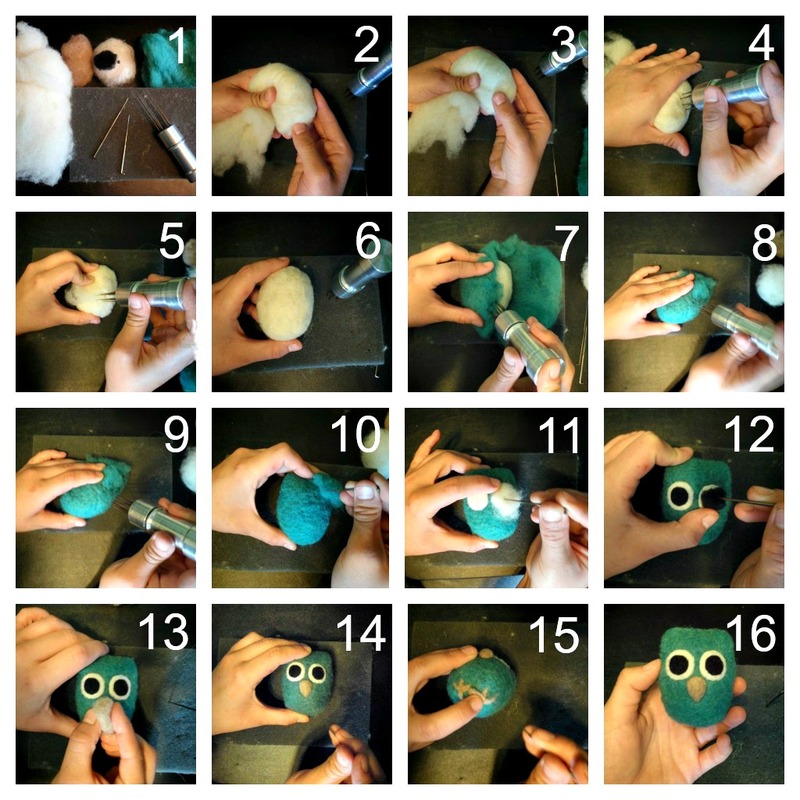 Here is a step-by-step example of how chunks of wool turn into something super cute. (Some steps are bigger than others.) I shared this picture a while back on my facebook page, but now I get to describe what you are seeing. Step 1: Here you can see my different tools (described here) and the chunks of wool roving that I have gathered for the project. There is a large portion of core wool, some light brown for the beak and feet, white and black for the eyes, and teal for the body of the owl. Steps 2-6: In these steps I create the base shape for the owl with the core wool and the 6-needle tool. Here I gather and shape the wool with my hands before I begin stabbing it. I roll, gather, stab, roll, gather, stab until all the wool is felted into the base shape. Step 10: After the body color is attached, I add another chunk of the same color for the owl's ear tufts. (The educator in me would like to speak up and say the feathers on some owl's heads are called ear tufts but are not actually ears. Owls' ears are located underneath feathers not too far from their eyes, much like where ours are positioned. They are also lopsided--one ear is higher than the other--which gives owl's impeccable hearing.) Thanks for indulging me. Steps 13-14: Here I use the light brown for a cute little owl beak. Again, I use one needle to carefully sculpt a cute, little beak shape. (Did you know owls can't smell...?) Sorry, couldn't help it. Step 15: Of course he needs little feet. Three toes in front and one in back. (Owl feet are extremely strong and they have super sharp talons on each toe to help catch their prey.) I'm no longer keeping the educator at bay, by the way. Step 16: All done! Now he's ready to sit on a bookshelf or desk so he can watch over you and make you smile. I LOVE the goodies you sent me, I am so in love with the little owl, he is adorable. The jewelry was so unique, I am so lucky to have had you as my gift partner.